I have not been knitting much lately, at least not as much I normally do. The bobbin lace has me too excited and it is taking a lot of time to achieve every exercise (which are getting more complicated, of course). I still have a few things to finish but for now, priority number ONE is to finish the Liliac Leaves Shawl. It is going pretty well. I am done with 20 repetitions of the pattern and I am planning to make 30 and see how long it gets. The idea of Irene is to wear to over the shoulders and tie it on the back so it has to be long enough to cover shoulders, back and be tied. After I finish the body of the shawl I have to calculate the number of stitches that I have to cast on (it will be a HUGE amount of stitches!!) to knit the edges. 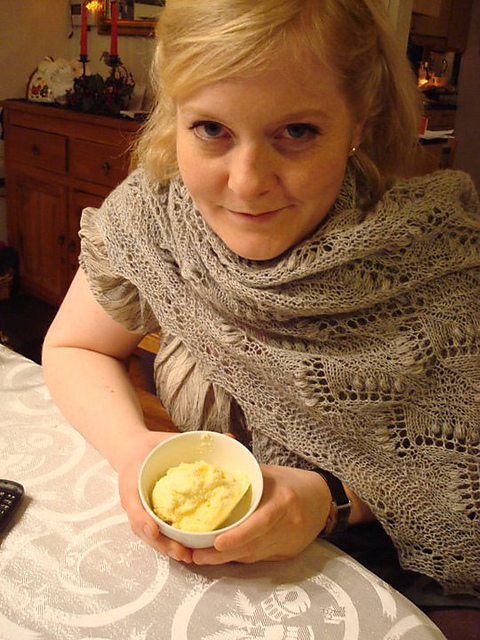 I will make it in the Estonian traditional way: Edges are knitted in stitch stitch always (WS and RS) so it knits really fast and the edge is made in two parts that are I sewed on the body of the shawl. I have done that once before and the result is pretty neat. Maikell: Detail of sewed on edge. 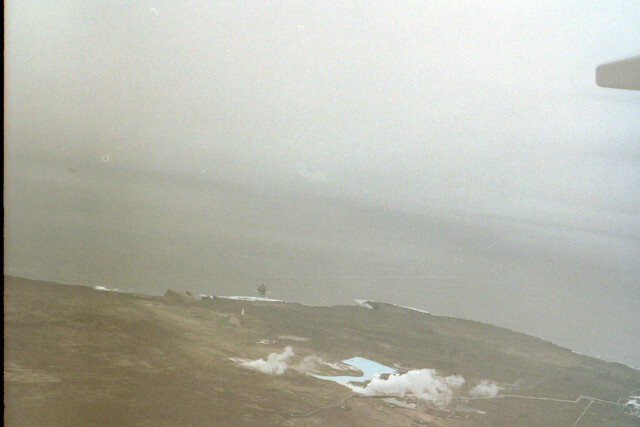 Maikell: Body and edge. It is not so easy to tell where the sewing was made. For now, my goal is to have the body done hopefully on saturday. I still have a little more than three weeks to finish it. Irene will be going back to Italy at the end of the second week of July and I want her to take the shawl with her. I really want to finish this shawl soon. I need to start something new!! 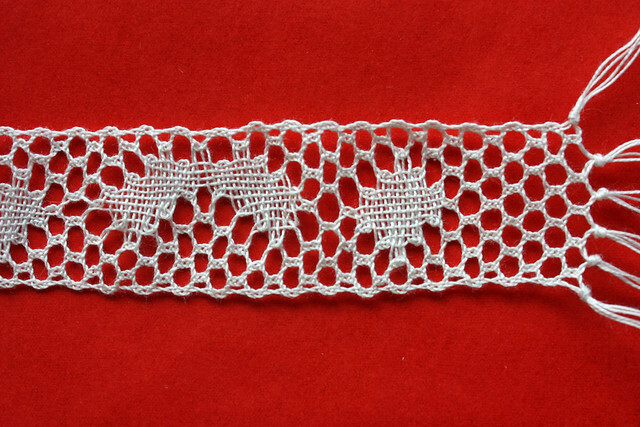 I am already thinking about the next project and it will be from a book called Victorian Lace Today. I found the perfect, cute shawl for a friend! I will let you know which one is it when the time to begin with it comes! Last week, my dear friend Laura from Asturias, asked me for some help to understand a pattern from the last Rowan magazine. 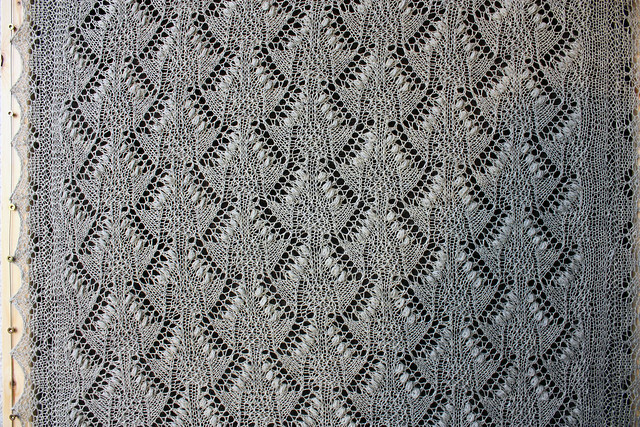 I had never read a pattern from Rowan before and I must say that it was pretty complicated to understand exactly what had to be done! It kept me thinking and reading the pattern (it was actually a paragraph only) over and over again for almost one hour! I thought I understood it but to be sure I contacted the people from Rowan and to my surprise I got a reply REALLY quickly and very detailed!! I also got some help from a forum in Ravelry (Ravelry people NEVER fails! It is so cool to know that there is always someone there ready to help!) and after all I wasn't so lost on terms of what I understood from the pattern at first. One thing that I learned (and that I hadn't noticed before): British terminology is SO different!! I think that until now I hadn't come close to any british patterns... things like a simple YO (yarn over) is a YFWD (yarn forward?!!) among others. Tomorrow people will be meeting in Reykjavík (in a place called Austurvöllur) for knitting in public on the World Wide Knit in Public Day. I am thinking about going. Since I began to knit I have never taken part of it but this year will be different. The only concern I have is the weather. According to the metereological office it will be raining... if so I don't think I will go. But you never know! The weather prediction changes constantly here in Iceland... it is actually fun to look at the website of the office regularly and check how they change the reports many times... even during the same day! 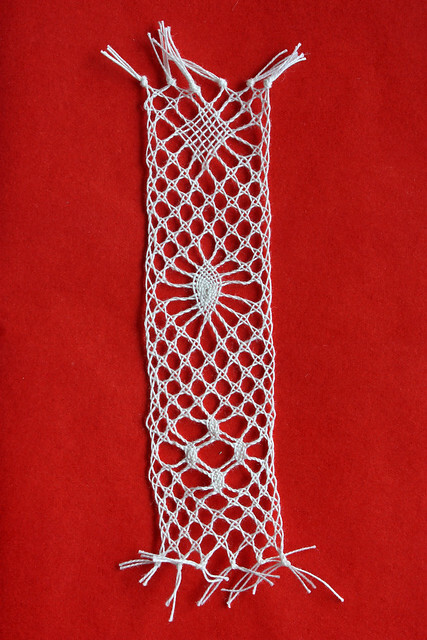 About bobbin lace (aka the new obssession). I am already done with exercises n°3 and 4. Exercise n°3 was about cloth stitch. I am not very happy with it. 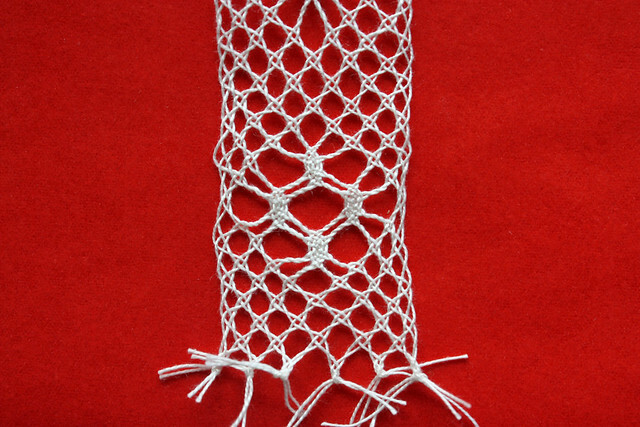 The net section look good but the solid parts (cloth stitch) don't. I was checking pictures on the net and it wasn't that I was making it terribly wrong (though I made some mistakes... some turns with there shouldn't be). It always looks kind of messy. So, cloth stitch: Definetely not one of my favourites. Exercise n°3: This kept me busy for several hours!! Detail: The net looks ok but the solid parts... not so convinced. Exercise n°4: This was a wonrderful exercise! It was about spiders! I made a sampler with three different kinds of spiders: a diamond spider (not very pretty I think). A crossed spider (my favourite one) and a group of little croessed spiders. I still have to work the tension better. As you probably can see in the pictures the some legs of the spiders are a little bit too loose. I have to practice more! Not my favourite one. I really need to watch the tension much better. I really lked this one. The same again: Some legs are too loose. Cuantas "perfecciones" deseando ser más perfectas. Todo un desfile de obras preciosas. Martha! Gracias por pasar! Las aranas son mis favoritas también! Y lo mejor es que no son nada difíciles de hacer! :) Lo del chal... tengo que aplicarme un poco y terminarlo de una vez! Un beso! ohh a cual cosa mas bella !!! Good Evening! It's early evening here, but I don't know what the time difference is from here to there. 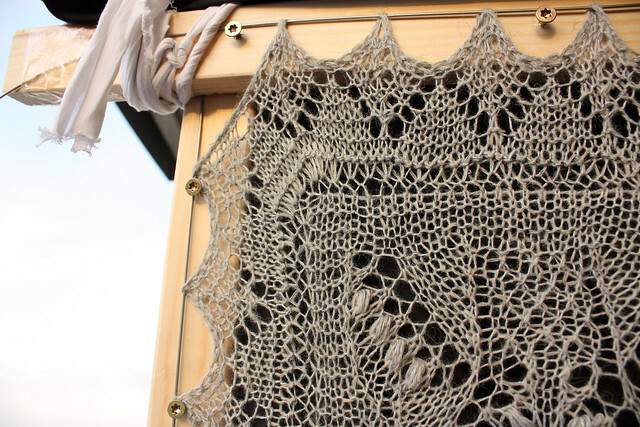 Perhaps you are in dreamland right now with visions of finished shawls dancing in your head. 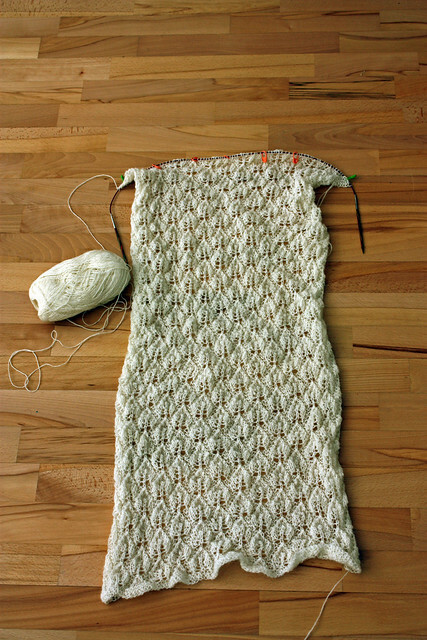 :-) Your wedding shawl is coming along and I'm sure is going to turn out beautifully. I'm anxious to see it blocked so the design can be seen better. I couldn't believe it when you said the edging is made and then sewn onto the shawl! Who thinks of these things, anyway?! The one you made for your friend at Christmas (who is very pretty, by the way)is gorgeous! What a treasure to be gifted and own. You certainly must be a very special friend. :-) Tomorrow is Saturday - will the body of the shawl be done? How long will it take you to do the edging and then sew it on? 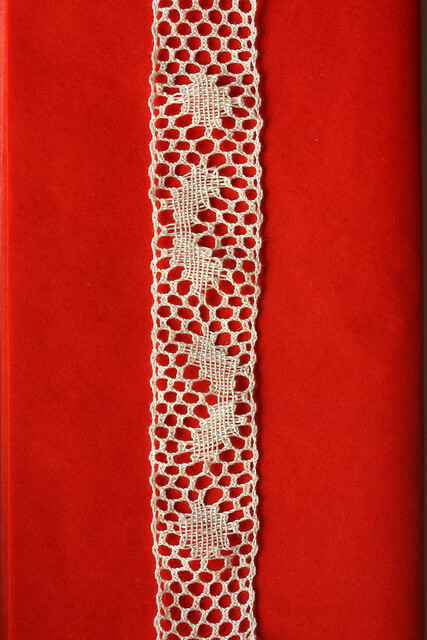 I looked up the book "Victorian Lace Today" and was able to only see 3 of the items inside, but liked 2 of the 3, so that's not bad. Will be anxious to see if your choice is one of them. I really like the top your friend, Laura, is making. I could identify with your difficulty in understanding the British pattern terminology. I started a sweater last fall and I discovered quite soon that I needed to go to the online conversion site and change everything from cm to inches! There were other terms, too, but because the sweater, vest type actually, is quite simple, I was able to figure it out - or do my own thing, with hopefully the desired results! I tired of it after finishing the back and getting the fronts about 1/3 done, so haven't touched it in awhile, but am getting back in the mood to pick it up again soon. :-) I have had difficulty with Rowan patterns in the past, too, so will have to remember to follow your example to directly contact Rowan should I ever choose one of their patterns again and get frustrated with it. I was impressed at your willingness to spend so much time and effort on it. You certainly must be a very special friend! Did you end up going to the Knit in Public place? They had a group meeting at a public library here, but it didn't work out for me to attend. Hopefully next year. Ahh....now back to the bobbin lace. You are moving right along on your samples. 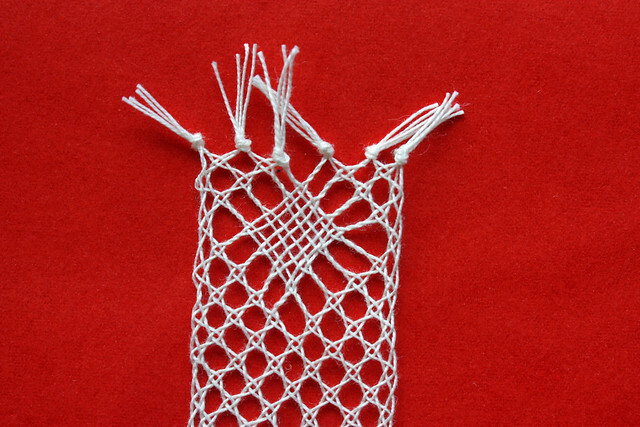 You are really getting good at making the net sections:-)I think the problem with the cloth stitch is when we say/think "cloth," we expect a more dense, tighter weave, and with lace that's not likely to happen. I wouldn't know a mistake from what's correct, so it looks fine to me. I'll tell you right off the bat that I am NOT a fan of spiders! I can see how the design resembles spiders, but why couldn't they think of something pretty to call them instead! I, too, definitely like the one in the center best. It is a pretty design. For first time effort, I think you're doing unbelievably well. :-) As the saying goes, "Practice makes perfect." If you were to make finished strips, perhaps longer than your samples, would/could you then join them together to make a larger finishes item? The "Coming Home" photo is really neat, and yes I see the lighthouse, but I do like your sunsets best. Will be interesting to see what you come up with next. We have been having horrible hot and humid weather and there is no break in sight for at least another week. It was still in the 80's early this morning, so I hurried outside to pull the dead stalks off the daylillies that are done blooming. Some of them will bloom again in the fall if the stalks are removed. I wasn't out there more than 20 minutes and hurried to finish so I could return to cool air where I can breathe easier. I so love being outside, but this area doesn't make it easy for me. :-( I need to be inside, though, working on some major sewing projects for my son, so it makes it forces me to stick to it. The sewn on edge... an Estonian thing. I would have never come up with such an idea! It seems to be lot of work but it is actually not so bad. The edge is generally knitted really fast. Sewing is the challenge for me. I am not very good at it but this is, again, very simple. Well, today is Monday. I made the 30 repetitions of the pattern, I had my friend try it on but it is still not long enough... so I will have to make some more!! Endless shawl!! It is good to see that I am not the only one that had troubles with the "Rowan language". Wow, that was confusing... and SO simple in the end! I would have phrases the whole thing in a totaly different way! 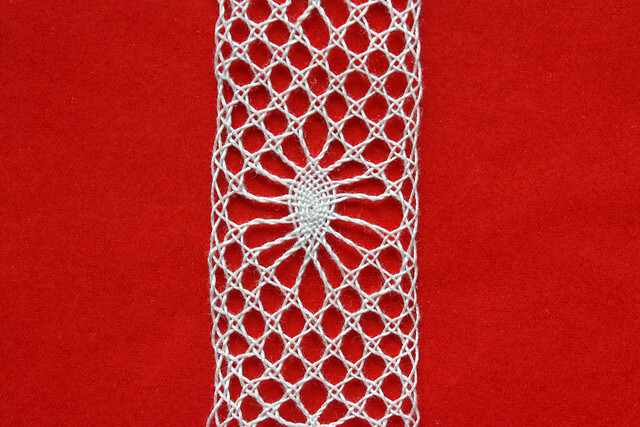 Bobbin lace... I am just loving it! Can't wait to be able to start making real projects and not just exercises! The spiders are my fav thing this far... they look great! (despite of the name hehe). When does it start to cool down over there?